Last one for the backlog! Finally, the last of my backlogged bento. I guess this means I should start cooking again, yes? This one is pretty simple to prepare. Complicated looking yes, but really quite easy. First, I cook my protein dish. In this case, fish. These are fish fillets, cut into manageable pieces, then pangrilled in a soy sauce and sake glaze. No actual recipe yet as it still needs tweaking. Quite edible though. For the veggie component, I quickly sauteed some cut asparagus spears, in olive oil, garlic, and a sprinkling of rock salt. I like cooking veggies this way because they remain crisp, is relatively healthy and is very flavorful. To add a bit of color, I have fancy fishballs to the rescue! These rainbow colored fishballs come in a wide array of variants like crabmeat, fish, prawn, taro and crab roe. These can be purchased from SM Supermarket’s frozen section, packaged as hotpot fishballs. 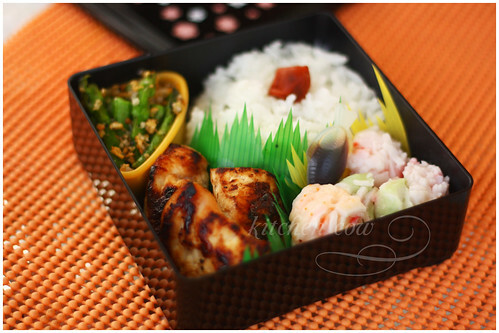 For this bento, I simply boiled them in water, but they’re doubly marvelous thrown in a steaming hotpot. I like eating these like I do siomai and dumplings, so I also packed a small container of soy sauce and calamansi juice. Lastly, I finish it off with rice, topped with an umeboshi. Meal complete, in under 30 minutes. Easy, peasy, yes? 6 Responses to Last one for the backlog! Where did you buy the ume plum? Thanks~! Try Japanese groceries, ask for umeboshi. It’s usually a standard item in the refrigerated section. AFAIK, puro candied plum ang nasa Aji Ichiban. There are just the preserved kind you put on food. Ahaha, ganun ba. I never bought umeboshi before, I used to see some dried plums stored in big jar containers in Aji Ichiban. I wasn’t sure if it was candied or the ones that you use.